This past Friday was the big SQL Server event of the year in Prior Lake, MN with the first ever SQL Saturday on a Friday (for the R2 launch earlier this year we were around 240 people in attendance). Last year we simply put together our own little all day free event called PASSMN SQL Summit and this year we decided to leverage the SQL Saturday branding. Based on last year’s attendance of 100 people and the R2 launch this year we knew that we needed a large area to hold the event. This year we headed back to one of my previous employers and went to Mystic Lake Casino Hotel. We had over 280 people register for the event, around 20 decided to cancel, and then 50 that were still on the wait list (around 330 people signed up!). We ended up with approximately 250 show up for the event (around 40 people were wait list or just showed up – a 23.6% drop off rate, but the wait list or unregistered count made up for that and so did the sponsors) and then add another 30 or so headcount with the sponsors (probably more because they were taking shifts), so in all close to 280 or so in attendance. I was completely in awe by the turnout and I think we did surprisingly well getting everyone through the registration process in time for the opening sessions. speaker room – on the way to the event I thought about this, but when I arrived at the location and started setting everything up it slipped my mind. There actually was one other room in our area we could have leveraged, so next time I will make sure we get something setup where the speakers have an area designated for them to get prepared, relax, and place their items. speaker survey baskets – I did have four spare baskets from the raffle baskets and I simply didn’t get around to labeling them and placing them at the back of the rooms by the water stations. I thought about this after I placed the raffle baskets on the sponsor tables, but then I headed up to the registration area and forgot about it, plus I needed one more and I could have used a box. prize table signage – we had a prize table setup loaded with books, training video, and software (along with a couple of sponsor raffle baskets), but I didn’t have a ‘Prize Table’ sign. prize ticket distribution – should have provided the tickets ahead of time to the speakers or simply left some at the podium in each room for the speakers to give away during their sessions. We were providing each speaker with two tickets to give out so that an attendee could go and claim a prize at the table that was not labeled (I think people caught on though after a bit – tons of great books thanks to our sponsors and we got some of them autographed). speaker survey collection – because of the lack of baskets setup for these we didn’t communicate what we were doing with these. Basically we just wanted the speakers to collect them and keep them for their own personal feedback. I didn’t get any results, but I did ask people that attended. They said I did a good job and learned something new, so I am happy. I am sure I was a bit out of it, so hopefully I did a halfway decent job (don’t know what compels me to present and help organize the event). networking bingo card basket – once again we didn’t have any formal process for the collection of these either. A basket was finally setup on the prize table for people to place them, but we only had about 30 of them turned in by the end of the day (not a high rate for the work put into them, but great concept). bring camera – yeah I did have my blackjack phone, but an actual camera would have been a better idea and by the end of the day I didn’t take a single picture. Jason Strate did bring his, so I am anticipating some to be posted on his follow up blog posting sometime soon. double check event guide prior to print – wasn’t a huge deal, but there were a couple minor glitches. The schedule on the web site had Brian Knight’s sessions back to back and in the guide we had Brian Larson set to present in between his sessions. We simply made this designation on the poster by the room and made an announcement to the people in the room and standing in the hallway. Wasn’t a huge deal, but none the less a glitch. In the guide it also had two different times for the drawings, not a big deal. The other thing that I missed was stating that Microsoft User Group Support Services (MSFT UGSS) was also a sponsor and provided funding for the event. more communication – I should have provided more information to sponsors about a few things like how the raffle process was going to work at the end and came up with a table designation for them that placed them in the area according to their service. Some of the sponsors did swap tables, so that was solved for the most part (basically between the DBA and BI vendors). Should have provided more information in the event guide about prizes, breakfast, lunch, surveys, and PASSMN 2011 election. People asked for the most part and I explained it, but it would have helped to include a few more details in the guide and in email reminders prior to the event. 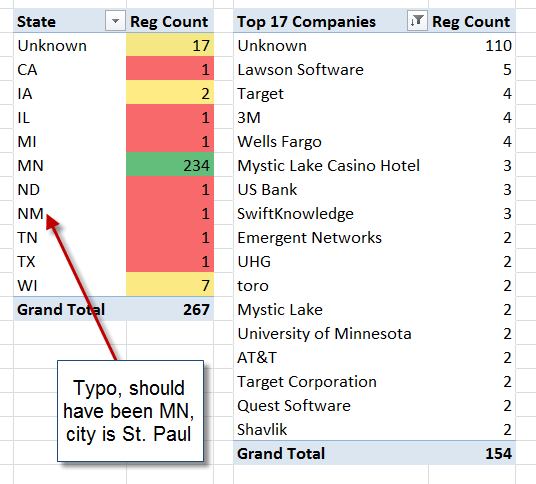 I did do one blog posting about the event prior to go-live, so hopefully that provided a little more insight – Inside Scoop on SQL Saturday 58 – Minnesota. Over communicating is never a bad thing, especially for such a large event. Live and learn I guess. This was a big task to pull off based on the size of the event. more planning time – so we started setting this up on August 9 with getting the SQL Saturday site setup and then on August 11 I started talks with Mystic Lake Casino. 81 days (2 months, 2 weeks, and 6 days) later the event happened. Pretty amazing that we were able to get 24 sponsors and everything put together in that time period, but all-in-all I think it was extremely successful and we can only improve upon this for next year. The PASSMN Executive Board did a great job in helping out and my wife also came through for me big time. I have a tough time asking for help and I am working on that and next year we will definitely need a few more people to help out during the day at registration and at the prize table (need to create a schedule and sign-up sheet). bring chap stick – sounds rather odd, but for some reason my lips got very dry and they still are today. It would have been nice to sit in on a couple of sessions, but I did not. I spent my time making sure everything was running smoothly, helped with registration, worked the prize table, talked with the sponsors, talked with speakers, and of course talked with attendees. I wish we would have been able to come up with some way to record them, maybe with more time we could have tried to get Live Meeting setup and have everyone record their sessions (if they were okay with that of course). Hopefully we will be able to get everyone to upload their content and have it available on the schedule page (click on the session and the download link will be available if they have done this). I uploaded my content today – Leverage the MS BI Toolset to Monitor Performance. I did get a lot of compliments on the event, the location, food, setup, speaker lineup, and prizes. That was good to hear. I hope everyone enjoyed it (how could you not?). I know I did and it made me feel really good to see everything come together and to have people actually show up, volunteer, sponsor the event, and for people to come and speak. We only had 16 speakers/volunteers show up for the dinner the night before the big event and 18 people show up for the after party (was hoping for more, so not sure what happened there – we hit the happy hour though). I would like to see some better numbers for these two items, so next year we will try and improve upon that. Now next year we will have to see if we have this on a Friday or Saturday. We would anticipate that we would need a larger lunch area if we provide food for the event. Mystic Lake could still work, but based on a convention style setup with the costs we would have to evaluate this (going to add a Platinum level for sponsorship). I will not be on the PASSMN Executive Board next year. After two years of being the Chair/President I have decided to open the spot up for someone new. I have definitely enjoyed being a part of the board and am very pleased with how things have gone the last couple of years. I will actually be shifting my focus over to the Microsoft BI User Group here in Minnesota next year. I will be working with GNet Group and Microsoft, so this will now include Superior Consulting Services. Next year I believe we are going to try to pool the two user groups together and combine forces to have another event like this, but try and make it even more special (is that possible? can it be done? yes, we can surely try or best). We might have to explore the possibility of going down to the U of M campus and doing it on a Saturday, but we will see because I am still not a fan of the Saturday events. We will publish a survey to get feedback about this year’s event along with suggestions/ideas for next year soon (please take a few minutes and provide some meaningful feedback with constructive comments). And just remember, this was a FREE event for all of the attendees. Simply amazing with a big kudos to all of the organizers, volunteers, Mystic Lake staff, and our sponsors! I did upload my presentation material and this is available on the schedule page once you click on the session – Leverage the MS BI Toolset to Monitor Performance. A reminder will be getting sent out to make sure that the other speakers upload their content as well, so hopefully over the next week or two all of them will be available. Well, that is it for this one. We should be ready to announce the new PASSMN 2011 Board shortly (doesn’t look like a vote will be needed – 2 years in a row). We will have three new members on the board next year and I will still be around and volunteer when needed. I am a fan of the SQL community, so I will always be around to help out. We still have at least one more meeting this year and possibly two if we have a December meeting and it seems like we typically squeeze one in. This entry was posted on October 31, 2010 at 7:01 am	and is filed under SQL Server, Training. Tagged: passmn, presentations, training. You can follow any responses to this entry through the RSS 2.0 feed. You can leave a response, or trackback from your own site. Very nice recap, sounds like it went well, congrats to the event team!